In July, eight Republican legislators, including Mayes and Cunningham, broke rank and voted for a bill extending California’s cap-and-trade program. On the day of the vote, Mayes posed for a photo in which he was smiling in between Gov. Jerry Brown and the Democratic leaders of both the Assembly and the state Senate. Following the vote, anger toward the Republicans who supported the cap-and-trade extension bill erupted at town halls and tea party gatherings. Activists also accused Mayes of having an affair with former assemblywoman Kristin Olsen, his predecessor as Republican Assembly leader. Mayes survived multiple challenges to his leadership position until Aug. 24, when the Assembly Republicans held a closed-door meeting and unanimously decided to replace him with Assemblyman Brian Dahle, a farmer from Lassen County. On Aug. 29, Democratic Assembly Speaker Anthony Rendon authored a letter announcing numerous changes to committee assignments that were allegedly ordered by Mayes. Conservative Assemblywoman Melissa Melendez was stripped of leadership roles on committees, while Cunningham was elevated to co-chair of the Assembly Legislative Ethics Committee. Additionally, Mayes recently booted Melendez out of her office and moved her into “the Doghouse,” a very small office at the Capitol. Cunningham, on the other hand, received a $4,400 contribution from Mayes. Incoming Assembly Republican leader Dahle reportedly had no say in the committee assignment changes. Following the changes, conservative leaders in California are accusing Mayes of colluding with California Democrats and sabotaging the state Republican Party. Wow- is it any wonder that the California Republican party is damn near extinct? Didn’t tale long for Cunningham to know where is bread is buttered. Another reason to make sure he doesn’t get re-elected. Anyone that has followed this story knows that there were seven (7) democrats up for re-election and their Party did not want them to vote for Cap-and-Trade and then have to defend it in their re-election. So, Gov Brown convinced 7 ignorance Republicans to vote for it and save the Democrats. Good job, Cunningham, for your lack of trust. You can be like the rest of the Repub’s in Washington that swim in the swamp with the Lobbyists and Democrats. Another member of the Party of Stupid! Don’t think there is anything Jordan Cunningham can do to get my vote again, you have sold out the taxpayers Jordan time for you to go, bye bye. Let hope it’s one and done for him, man that dude got corrupt fast. That might be some sort of record. Boy that didn’t take long! You send someone to do the job who acquired him for then he sells himself to the devil. Well Jordon I’m still waiting to tell me about all of the taxes that you are going to save for me. Politics, what a joke with the Jokesters that get elected. Sadly, as this article indicates, local Assemblyman Jordan Cunningham is need deep in the swamp known as the state capitol in Sacramento. Outgoing GOP leader Chad Mayes is rewarding Cunningham for colluding with Democrats on cap-and-trade legislation, and I guess Cunningham thought it more important to get a bigger office than to be true to the people who elected him to office. 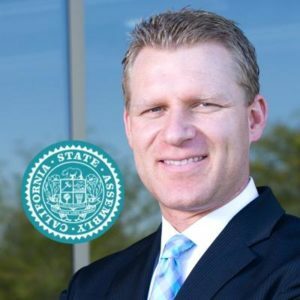 Assemblyman Jordan Cunningham has betrayed Central Coast taxpayers, and we should betray him when he is running for reelection. This is the kind of fanaticism that makes for impossibly polarized politics from the local level to Washington DC. The Republicans in California have even less political power than the Democrats do nationally. If they want to get ANYTHING done, they need to make some compromises. They don’t have to compromise on everything but there are some things worth a compromise. Until someone shows me otherwise, I am going to believe that this is what Cunningham and Mayes and a few others did. Expecting strict ideological votes when your party lacks the power to do anything productive on its own is both short-sighted and dumb. If you want to criticize Mayes for rewarding Cunningham and penalizing others for their positions with petty office politics and campaign contributions, that is reasonable.